I adore eating this cake with a scoopful of ice cream. I had about a million ideas running through my head of what I thought I was going to make for dessert – but as for motivation…. zipo, zilch!!! 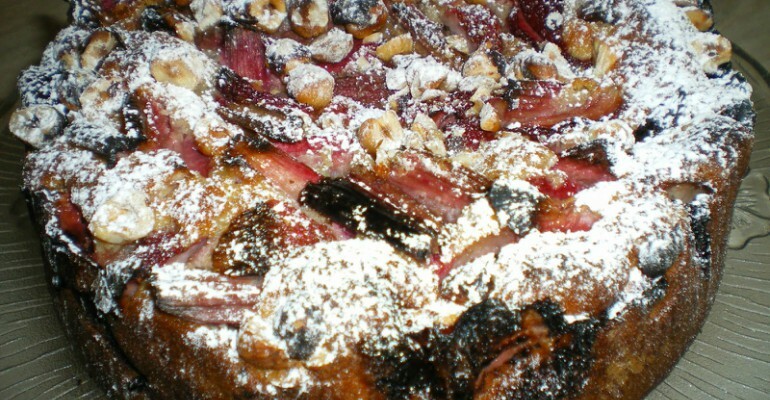 I unfortunately or fortunately depending on how you look at it, had to make a mad dash to the local fruit and vegie shop, and it was there that I found the recipe for a Rhubarb and Hazelnut Cake. It looked interesting. I had all the necessary ingredients. I also had some strawberries, that I was going to do something else with, but had just never got around to it. Perhaps we can combine them all??? This cake is truly something special and should be served any time you wish to impress the masses. Preheat oven to 160 degrees C. Grease and line a 22cm round springform pan with baking paper. Either with electric beaters (or in the Thermomix) beat the butter and caster sugar until light and fluffy (in TM speed 5 for approximately 1 minute – scrape down bowl and repeat if necessary). Add eggs one at a time, beating well after each addition. (TM – still on speed 5 – for approximately 15-20 seconds). Gently fold in flour, milk and half of the hazelnuts (speed 2-3 – 10-20 seconds). Spoon mixture in to prepared pan. Evenly top the cake batter with the rhubarb and strawberries. Sprinkle with the remaining hazelnuts. Gently press the mixture into the cake batter. Bake for 1 hour or until the cake is cooked when tested with a skewer. Cool for 5 minutes in the pan, then turn out onto a wire rack. Dust with icing sugar. Quick Tip: Pair this yummy feast with garlic mashed potatoes. Thank you Cate Can Cook for this delicious recipe!